The Rt Hon Gisela Stuart, Labour MP Birmingham Edgbaston, Bartley Green, Harborne and Quinton: „The British people have voted to leave the European Union – „kleiner Mann, was nun?“ – to quote Hans Fallada…“ – Deutsch-Englische Gesellschaft Ruhr e. V.
The new Prime Minister said „Brexit means Bre xit“ and we have started the process of implementing the decision. What do our voters expect to happen next. How to we, the politicians go about healing the divisions highlighted by the referendum [North v South, urban v rural, England v Scotland]. And how will it change the European Union. Gisela has represented Birmingham Edgbaston since 1997. The constituency covers the City Council wards of Bartley Green, Edgbaston, Harborne and Quinton. Educated in what was then West Germany, Gisela served an apprenticeship in Bookselling. After Business Studies in Manchester Gisela got a law degree from London University. 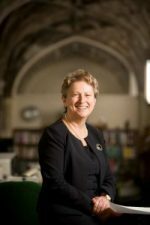 She ran the London Book Fair in the 1980s; then she became a lecturer and researched into pension law at Birmingham University. Sie erreichen das Clubhaus des ETUF mit der S-Bahnlinie S6 Richtung Köln-Düsseldorf, Haltestelle Essen-Hügel; mit dem Auto, indem Sie dem Hinweisschild ‚Baldeneysee’ bis zur Freiherr-vom-Stein Straße folgen. Bitte benutzen Sie den großen öffentlichen Parkplatz direkt an der Hauptstraße und nicht den Parkplatz vor dem Clubhaus.